Are you currently a Showiteer using Showit Desktop? Learn all about transitioning to Showit 5! With the Adobe's 2017 announcement ending Flash support we will be discontinuing support of Showit Desktop on the timeline below. We encourage all users to switch to Showit 5 which is entirely powered by modern HMTL5 with a focus on mobile design. OCTOBER 1, 2018 - All users who want their Desktop sites to remain online (as-is, no publishing) must switch to a Showit 5 subscription by contacting support. THROUGH 2019 - Current sites will continue to function as-is through 2019, but the desktop application is no longer accessible. All users are encouraged to move to the new Showit 5 platform as soon as possible. After a year and a half of development, we have a total reboot of our software. We started over from the ground up to develop a new platform based entirely on HTML 5. In the past, Showit Desktop was a downloadable app, but Showit 5 is a web application, something that you use right inside your Chrome browser. Will the launch of Showit 5 update Showit Desktop? No, Showit 5 is entirely separate from Showit Desktop and will not update the app. We love what we’ve been doing with Showit 5! It is allowing users to build awesome websites through the use of some really great tools. There are some particular standouts, though, that you won’t be able to find elsewhere and that will give you the freedom to have a truly unique site that reflects your brand. The first is side-by-side desktop and mobile website building. This allows for you to create unique experiences for visitors on mobile and desktop screens. The next is interactivity inside of something we are calling Showit Canvas Views. This interactivity allows for a natural flow of content and a high level of creativity and originality for how information is displayed. And this last one is huge! People often ask how they can customize their blogs to look like their Showit sites, and now you can. Showit 5 can generate a WordPress theme to use for your blog so the blog will match the rest of your site. Showit 5 will allow you to create a theme directly from the application so there will be total fluidity between your site and your blog. You get the power and flexibility of WordPress with the design freedom of Showit. We are very excited about this. Do the designs from Showit Desktop move to Showit 5? Long answer: The design of how we originally built Showit Desktop didn’t incorporate scrolling, but the current trends for web design are moving towards scrolling. That is something Showit 5 implements really well, but it changes the way your navigation and layouts work, and it means that your original Showit designs don’t necessarily translate well into Showit 5. If you’ve gone through the process and the hard work of deciding what you want your design to look like, it’s fairly straightforward to recreate the same look and feel in Showit 5. Can my media and photos be moved over to Showit 5? Will my Showit Desktop site go down when I login to Showit 5? Your published website won’t be affected when you login to Showit 5. It will remain live until you configure your domain and publish from Showit 5. Will Showit 5 cost more? We are including Showit 5 for free with a Showit Desktop subscription. It costs nothing more to add Showit 5 to your account. Two additional pricing levels are available to transition to. More info on our pricing page. Are there +Sites with Showit 5? Yes, we will still provide unlimited +Sites controlled by a single domain name. How will SEO work in Showit 5? A lot of the designs lean towards a longer scrolling site, which is actually great for Google SEO when you have a lot of good content. We’re following best SEO practices with how we structure content, so it will be SEO-friendly. If you have a WordPress blog that you hook to your site, it works even better as you continue to create content. Ready To Publish Your New Showit Site? 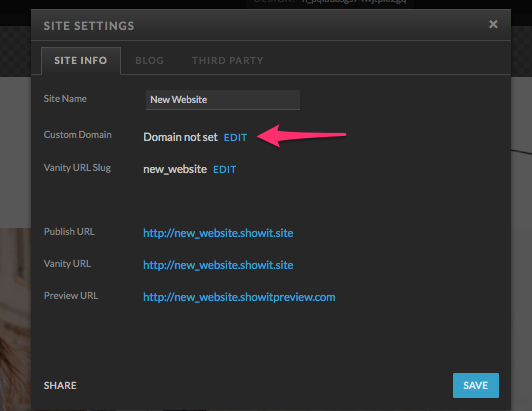 In the top left corner of Showit 5, navigate to "Site Settings". This will pull up your site and blog information. Next to "Custom Domain" be sure to select your primary domain from the list so your new site design will be published to replace your Showit Desktop site. If you currently have a blog hosted with us, be sure to select your blog domain under the "Blog" tab in your Site Settings. Contact the Support Pros to get the Showit Plugin up to date and compatible with Showit 5 on your blog. Learn more about the transition process.